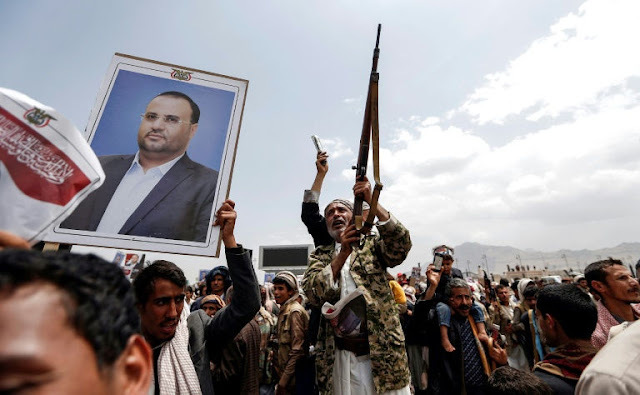 In a speech eulogising Sammad on Saturday night, rebel chief Abdul Malik al-Huthi claimed Saudi Arabia and its allies had targeted the outskirts of Sabaeen Square as Huthi supporters gathered for Sammad's funeral. The rebels' Al-Masirah television aired footage of black columns of smoke billowing outside the square, where Yemenis chanted slogans calling for the demise of Saudi Arabia and the United States. The date of the footage could not be immediately verified. The Huthi leader slammed Saudi Arabia and its allies, primarily the United Arab Emirates, for operating "under the umbrella" of the United States and Israel, saying Sammad's death was "added incentive" for the rebels. The Huthis, who hail from northern Yemen, control Sanaa and much of the country's north -- which borders Saudi Arabia -- and the key Hodeida port on the Red Sea coast. Saturday's attacks came just ahead of the arrival of newly appointed US Secretary of State Mike Pompeo, who touched down in Riyadh for meetings set to including talks on the Yemen conflict. Tehran blames Saudi Arabia for the devastating Yemen war, which has left millions struggling to secure food. Yemen now stands on the brink of famine. 0 Response to "Saudi-led strike 'kills dozens' of Yemen rebels"